Jimmy Barrientes like to fish Calaveras Lake at night. Barrientes likes to take his 18-foot Kenner out after work, around dusk. He catches red drum and stripers, and catfish in the winter – “big ones,” he says, upwards of 18 pounds. He’s one of many CPS Energy employees — and one of the hundreds of thousands of visitors each year — who take advantage of the recreational opportunities at Calaveras and Braunig, the man-made lakes that cool the utility’s coal and natural gas plants. Following the record drought of the late 1950s, and a growing need to conserve Edwards Aquifer water for drinking, CPS Energy began using treated wastewater from the San Antonio River to fill the new lakes. Doing so saves more than 40,000 acre feet of drinking water from the aquifer each year. By using recycled water, CPS Energy has avoided using 320 billion gallons of Edwards Aquifer drinking water since the lakes were built — that’s enough water to fill every bathtub in the country. While they’re owned by CPS Energy, the parks are managed by Thousand Trails, which bills itself as the largest provider of RV parks and campgrounds in North America. Glenda Gaona, the area manager for Calaveras and Braunig, says the parks saw almost 100,000 visitors just between January and March of this year – and that’s considered slow compared to previous years, she thinks because of the colder weather. But in general, she said, their popularity is increasing. “I think people are getting to know more about them,” said Gaona, who has worked at the parks since 2001. She noted that amenities have been updated, including new picnic tables and boat docks. “It looks a lot better now,” she says. 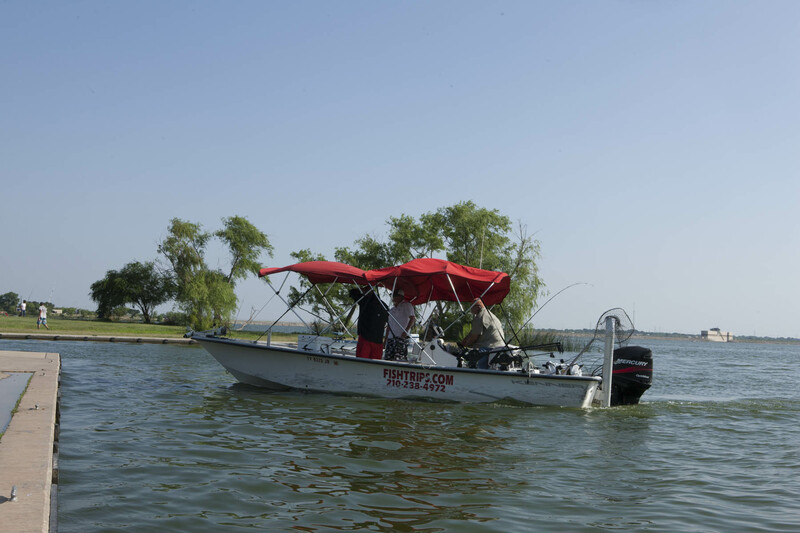 The lakes were recently featured in Texas Parks & Wildlife Magazine’s March issue as part of a feature on the fantastic fishing to be found in the state’s electric cooling lakes. Texas has about 20 lakes used to supply cooling water for power plants, the story notes, and they stay warm and full all year long. Catfishing at Calaveras is good all year long, and both it and Braunig are known for their red drum fisheries, striped bass and of course, catfish. Shawn Reese, a control room operator at Spruce, has been a professional fishing guide since 1989. Shawn Reese guarantees visitors will catch fish on his tours. On a trip with four guests once, they caught 100 catfish in two hours, he said. “They hire me, we go out and catch fish,” said Reese, who grew up fishing on the lakes. Carlos Silva doesn’t own a boat, but that doesn’t stop him from fishing. A pole crew truck driver with 14 years under his belt, Silva says he’s been a regular on the lakes for the last decade. When his children were younger, he said, they often camped out for Easter weekend. Today, he says, “I try to get out at least once a month.” He casts from the banks of Braunig Lake in the early mornings. And while Barrientes says he doesn’t often eat what he catches – “I hate cleaning them,” he admits, and so often passes his fish along to friends – Silva says he bakes, fries and grills what he catches. His latest haul included two catfish, one an eight-pounder, the other weighing in at twelve pounds. David Herbst, senior vice president for power generation at CPS Energy, doesn’t get out all that regularly, but recently took his grandson Patrick Walls out for the day, along with son-in-law Jason Garrish, recently returned from active duty in the Middle East. On leave, Garrish wanted to cross Texas fishing off his bucket list, said Herbst. “There was no time to go to the coast, so we went to Calaveras,” he said. “We had a blast” – especially Patrick, 9, who caught himself a 15 pound catfish. 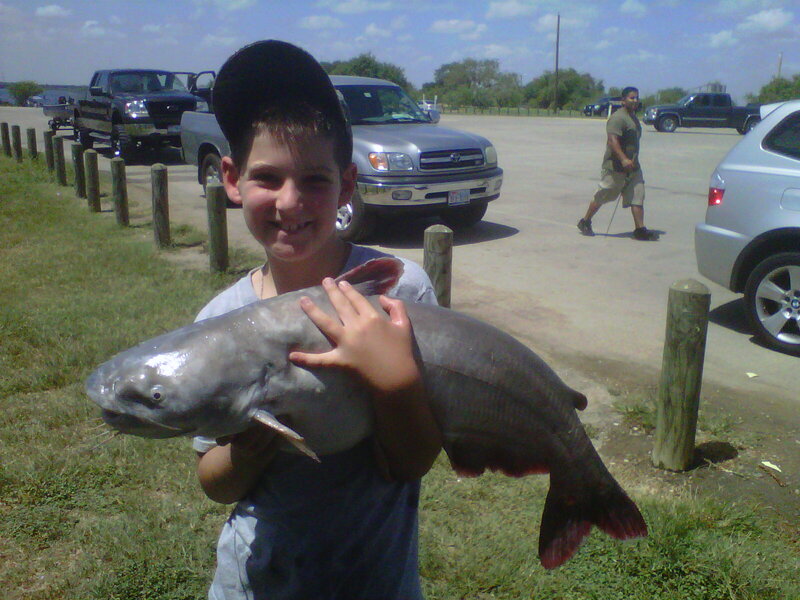 Nine-year-old Patrick Walls shows off the catfish he recently hooked at Calaveras Lake. Last month, Calaveras Lake was overrun with children as part of Kids’ Fish Day, an annual event hosted by CPS Energy, and staffed by employee volunteers. This Saturday, 40 children disabled children from Respite Care of San Antonio will spend the day fishing. After a big breakfast, they’ll learn water safety from a Texas Parks & Wildlife game warden, and get their own pole, tackle box, hat and shirt. Parks & Wildlife makes sure the day will be a success – they net off a small cove, stock it with more than 700 pounds of catfish fish the day before, then make sure they’re nice and hungry the morning of Kids’ Fish Day. “When they catch their first fish, it’s so wonderful to see their faces,” says Lorie Svoboda, who works in current asset management, and has been volunteering for Kids’ Fish Day with her husband and son for the past three years. “It’s a great way to share our knowledge and love of the outdoors with the kids,” she said.